LOS ANGELES and SAN JUAN, Puerto Rico, Nov. 30, 2017 /PRNewswire/ -- sonnen, the global market leader in intelligent residential energy storage, today announced the official formation of the sonnen Foundation for Energy Security, following an executive leadership visit and subsequent microgrid tour alongside Puerto Rican government officials and its local energy partner on the island, Pura Energia. 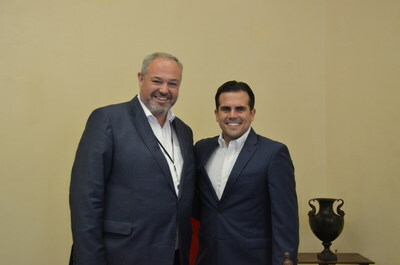 sonnen Global CEO, Christoph Ostermann, meeting with Ricardo Rosselló, Governor of Puerto Rico. Christoph Ostermann, global CEO of sonnen, and Blake Richetta, SVP of sonnen, Inc., with Pura Energia's David Portalatin and community spokesperson, Christine Nievas at the sonnen microgrid in Humacao. The Foundation's platform will enable the implementation of additional microgrids at sites around Puerto Rico, including schools, community centers and relief shelters. This mission of bringing relief to individuals and entire communities in need, including those affected by energy instability, speaks to sonnen's core principles for achieving clean, reliable and affordable energy for all. "This trip deeply impacted our entire leadership team and solidified our resolve to help the people of Puerto Rico," said Christoph Ostermann, CEO of sonnen, who was visibly moved by the impact of the microgrids on the local community. "Speaking with government officials, residents and our partners on the ground gave us a 'hands on' understanding of the magnitude of suffering that has occurred since Hurricane Maria. We come away from this trip with as clear a vision as ever before for Puerto Rico and the rest of the world." Lavanderia microgrids – sonnen and Pura Energia have installed three solar microgrids in La Perla (8kW power / 16kWh capacity), Loiza (4kw / 8kWh) and Morovis (8kW / 16kWh) used to power community washing machines, refrigerators and some basic electrical outlets. Installed in communities whose water is contaminated by the deadly Leptospirosis bacteria, each microgrid is supporting hundreds of homes in its respective neighborhood. Loma La Nina Mariana microgrid – Located in Humacao, one of the most devastated areas of Puerto Rico, "Proyecto Apoyo Mutuo Mariana" is a village community center that was converted into a food shelter to feed its residents. The sonnen eco16 (8kW / 16kWh) works with a solar array to provide refrigeration and meal preparation for up to 500 individuals per day, in addition to clean water storage and basic electricity used to power Wi-Fi communications. Help Me! Aguadilla microgrid – A sonnen eco8 (4kW / 8kWh) storage system combined with solar panels provides lights, refrigeration, microwaves and fans for a school that provides psychological services for children with behavioral and developmental disabilities in Aguadilla. The ability to power basic necessities for the school enables it to remain open. Maricao microgrid – Two sonnen eco8 (4kW / 8kWh) systems plus solar are powering refrigerators, lights, cellular router and other power services for a shelter housing 45 residents displaced by the hurricane in an isolated mountain town that will likely be without power for many months. "Puerto Rico is primed for solar energy as we have the sun power and our electricity is one of the most expensive things on the island," said Christine Enid Nieves, spokesperson for Loma La Nina Mariano. "Solar energy would have a huge impact on every Puerto Rican's financial situation, radically shifting the quality of life in the Caribbean. Power lines have been down since Hurricane Maria and grid services are not expected to be available for six to seven months or longer, making solar microgrids an essential element for relief and recovery." In addition to providing reliable energy for the community, the sonnen and Pura Energia microgrids offer a clean, maintenance-free and quiet alternative to the generators that are polluting the air in Puerto Rico every day, creating a public health concern and damaging the environment. 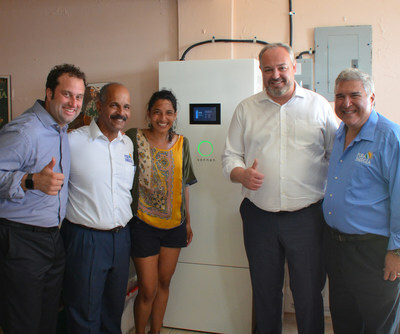 "sonnen's vision for Puerto Rico, like the established concept of sonnenCommunity in Europe and the United States, is to incorporate both solar and battery storage into new home development, resulting in an integrated approach that truly performs as a Virtual Power Plant (VPP)," said Blake Richetta, sonnen's Senior Vice President and head of the U.S. subsidiary. "Investing in Puerto Rico now will pave the way not only for recovery, but for long-term growth and prosperity. As a country, if we fail to invest in Puerto Rico during this time of need, the result could be disastrous." sonnen also met with the Department of Economic Development to discuss business investments in Puerto Rico, expanding the Company's distribution channel to the island and creating jobs to aid in their economic recovery. "The vision of sonnen is aligned with the commitment of Gov. Ricardo Rosello's administration in rebuilding a solid electrical infrastructure based on different alternative energy sources," said Manual Laboy, Secretary of Economic Development and Commerce. "We thank sonnen and its local distributor, Pura Energia, for their efforts and commitment to the people of Puerto Rico, and we hope that this will be the beginning of a long-term relationship between sonnen and Puerto Rico." At sonnen, we believe clean, affordable, and reliable energy for all is one of the greatest challenges of our time. sonnen is a proven global leader in intelligent energy management solutions that provide greater energy control for residential customers through increased solar self-consumption, reduced peak energy usage and reliable backup power during outages – contributing to a cleaner and more reliable energy future. sonnen has won several awards for its energy innovations, including the 2017 Zayed Future Energy Prize, MIT's Technology Review's 50 Smartest Companies in 2016, Global Cleantech 100 for 2015-2017, Greentech Media's 2016 Grid Edge Award for innovation, and Cleantech's 2015 Company of the Year Award in both Israel and Europe.